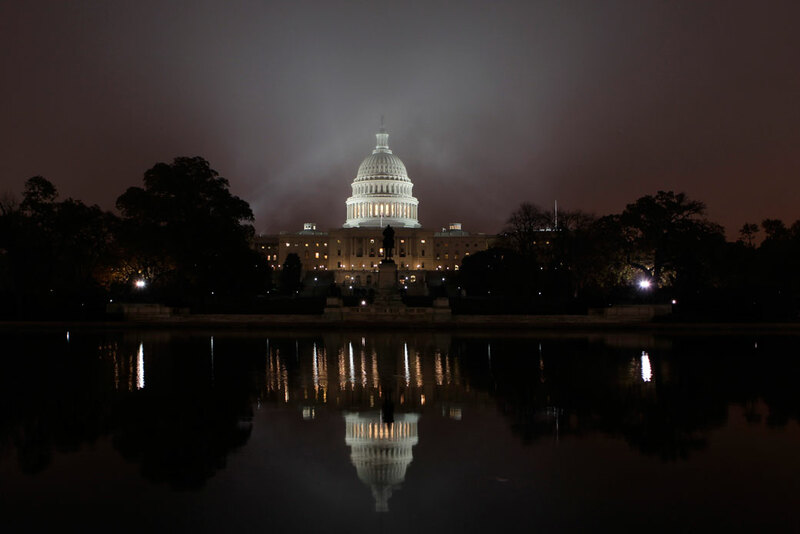 Fog envelopes Capitol Hill in Washington, November 2010. In order to reverse the power of wealthy special interests over government so that government works for the people, Americans need real change and not empty promises. A democratic government must serve the interests of the people through real actions—not empty words. However, the current rules regulating the use of money to influence elections and government lead to grievous conflicts and distortions in derogation of the duty of fair representation that elected representatives owe their constituents. The role that money plays in our political system is an even bigger problem for a healthy democracy given the massive wealth inequality in America today. Today’s top CEOs, for example, make 300 times more than the average worker.11 These individuals, the “top 1 percent of 1 percent of the population,” dominate campaign giving each election cycle with donation totals that dwarf those made by average Americans.12 The effect of having elected officials dependent on and aligned with the wealthiest few is reflected in the economic stagnation felt by most Americans, while the gains from the economic recovery in the last eight years since the Great Recession went almost entirely to the top 1 percent of wealthy Americans.13 Members of Congress and the executive branch must move from being mired in conflicting interests to delivering fair representation that improves the lives of all Americans. Americans need to see strong, clear proposals that will actually work to stop wealthy special interests from having an improper and anti-democratic amount of influence on the levers of government. Americans need to see strong, clear proposals that will actually work to stop wealthy special interests from having an improper and anti-democratic amount of influence on the levers of government. A holistic framework with rules for using money in elections and protecting voting rights and access is needed to revitalize our democracy. But for people to see their elected representatives and public officials working for them—and to see their ability to act as agents of change in our political system—Congress needs to clean its own house and demand the executive branch act ethically as well. It must adopt real solutions to address the threats inherent in special interest lobbying, revolving door politics, corruption of public service, and lax ethics and contracting oversight, as well as the major danger of direct conflicts of interest. Cabinet officials and other executive branch employees are required to sell assets that present conflicts of interest.21 While this specific law does not directly apply to the president, the Office of Government Ethics has concluded that “the President and the Vice President should conduct themselves as if they were so bound” by them.22 Congress should strengthen the nation’s laws that apply to all high-level public servants—including public disclosure of tax records—to cover the president and vice president in ways that are appropriate and protect the interests of Americans. The federal government’s ethics watchdogs in Congress and the executive branch should also be strengthened to ensure the interests of the American people are protected and that their representatives at the highest levels are working for them and not for wealthy special interests. Instead, on the eve of the new Congress, House Republicans voted 119-74 to amend the House Republicans’ rules package and destroy the Office of Congressional Ethics.23 While they ultimately walked back the attack for now, this attempt to eliminate the only independent watchdog with authority to investigate members of Congress’ ethics violations is unacceptable.24 It presents a bleak future for oversight and accountability mechanisms under the unified Republican majority government in the incoming Trump administration. Prohibit presidential appointees from participating in matters that directly involve the financial interests of the president and his or her family. Prohibit executive branch appointees from accepting gifts from lobbyists, codifying President Barack Obama’s executive order. Prevent the destruction of the Office of Congressional Ethics and the Office of Government Ethics and strengthen them with greater independence and authority, including subpoena power. American interests are not best served in an environment where their representatives are aligned with wealthy special interests instead of being able to fairly represent all of their constituents. Ban people engaged in lobbying for special interests from political fundraising and bundling for political campaigns and parties.31 This includes banning registered foreign lobbyists from fundraising. Disclosure requirements would apply to people engaged in lobbying support for special interests, such as political and messaging strategy and outreach. Update the form and content of lobbying disclosures to provide more detailed information about the activities taken to influence government policy and require that information to be filed electronically in a public, searchable database. Require congressional offices and the executive branch to publish their lobbying contacts and publicly disclose whom they meet with and the subject of the meeting, particularly where specific legislation or policy matters are addressed. Our government cannot have the foxes guarding the hen house. When people move between working in government service and private business and special interest lobbying, often repeatedly, it raises great risks that the interests of business will remain paramount and given priority consideration in government decisions. As it now stands, ex-government staffers can bring their personal connections in government to their new roles as lobbyists for private business interests. And ex-business people can go into a new role leading a government agency overseeing their former industry. President Obama imposed further ethics and revolving door restrictions on executive branch personnel with an executive order that prohibited executive branch personnel from working on matters that involved issues related to former clients or employers for two years and expanded the ban on senior officials contacting former agencies to the duration of the administration.42 The order also prohibited gifts from registered lobbyists. Enact a lifetime ban on special interest lobbying for members of Congress. For congressional and executive senior staff members, a five-year ban on special interest lobbying should be imposed. Bar members of Congress and congressional and executive senior staff from representing the interests of a foreign government. Bar government appointees involved in policy decisions from working for private entities that have benefited from those policy decisions for at least two years. Require government employees to recuse themselves from cases involving their former employers for two years, expanded from the current one-year ban. Require members of Congress to more effectively publicly disclose future job seeking while they’re in office and change the process so that determinations of conflicts of interest are not be left up to the individual member. In a time of cratering trust in government, the nation’s laws against public corruption have been inappropriately undermined. Seventy-five percent of Americans believe that corruption in government is widespread, and yet, in a time of cratering trust in government, the nation’s laws against public corruption have been inappropriately undermined.47 For example, the recent U.S. Supreme Court’s decision in McDonnell v. United States48 narrowed the application of the basic bribery, extortion, and illegal gratuities laws under which former Virginia Gov. Robert McDonnell (R) had been convicted. As Lyle Denniston of SCOTUSblog explains, “[B]y a sharp cutback of what kind of ‘official act’ will be treated as corrupt when done in return for money or gifts, the [McDonnell] ruling poses a major challenge to prosecutors seeking to police official misconduct.”49 Congress must respond by clarifying that it is illegal to take official actions to advance the interests of financial supporters in return for cash, loans, or gifts. The fundraising demands placed on public officials also create pressure on elected representatives because the current system for financing campaigns requires them to spend nearly half their time raising money for re-election rather than working on behalf of both their constituents and the country.52 Rules for using money in politics need to be radically reoriented so public officials are dependent on, and thus responsive to, the public. The interests of elected officials must be aligned with the general public rather than wealthy special interests. A full exploration of solutions is beyond the scope of this brief, but at the minimum, the public has a right to know how much of their elected representatives’ time is spent raising money for elections. Rules for using money in politics need to be radically reoriented so public officials are dependent on, and thus responsive to, the public. All elected representatives should be required to publicly disclose the amount of time they spend engaged in fundraising and attending fundraising events. Existing federal pay-to-play laws ban government contractors from contributing directly to candidate campaigns, political parties, and political committees.60 But after Citizens United v. FEC,61 government contractors, just like any corporation, are able to spend unlimited sums of money through outside spending groups such as super PACs and tax-exempt nonprofits. Government contractors and their officials and representatives should not engage in political spending—at least not spending that affects elections for positions that oversee a contractor’s business or industry. Laws need to be strengthened to protect the people’s business from pay-to-play corruption and misuse of public funds. Other critical tools for the public to exercise accountability over government also need to be strengthened. For example, strengthening whistleblower protections can help lead to contractor or public misconduct being exposed. The Freedom of Information Act, or FOIA,62 requires agencies to make basic information publically available as well as release requested information. FOIA is a necessary part of a democratic system, and it needs to be brought up to date in order to work effectively for all Americans. Furthermore, the need for effective inspectors general at executive agencies has grown in importance, and they have a critical role to play in ensuring an efficient, accountable government that works for all Americans. Expand the ban on political spending by government contractors so it covers both direct contributions and political spending through new so-called “independent” channels such as 501(c)(4) and other dark money groups that hide donor identities. Until ban on government contractor political spending is expanded to cover new channels, require government contractors and their control groups to disclose all of their currently allowed political spending. Impose stricter penalties for contractors who violate their agreements or federal law by making the process for suspension and debarment referrals and reviews more efficient as well as by maintaining the recovery provisions in the False Claims Act. Increase whistleblower protections for government contractors, particularly in the intelligence community, to deter taxpayer waste and contractor abuse and for private-sector whistleblowers as a means to incentivize reports of fraud, along the lines of the False Claims Act. Subject the system of secret law developed in the executive branch to more public transparency and oversight. Reform process of defense spending and military acquisition and enhance public transparency for defense budgeting, as well as increase Department of Defense accountability for proper financial accounting. Maintain and improve the USASpending.Gov database to track all federal spending information and make it publicly available, accessible, and understandable. Reform the process of determining and collecting royalties, revenues, and fees from companies that extract natural resources from public lands to prioritize the interests of Americans instead of extractive industries. Modernize FOIA by narrowing exemptions, fixing loopholes, reducing fees, and strengthening the presumption of openness by codifying a requirement that agencies stop withholding information without a genuine reason to withhold. For example, no member of Congress should be prevented from accessing information due to a FOIA exemption. Make the FOIA system itself more transparent, efficient, and accountable to the public and allow for the tracking of requests. Americans voted for change in our federal political system and throughout the country at the state and local level.64 It is crucial that the political system respond. At this moment, too many of our fellow citizens are mired in cynicism and doubt that anything will ever work to break the power of wealthy and special interests over public policy. Disturbingly, some politicians have launched a calculated and cynical effort to deploy reform language to capture and centralize power in the hands of these very interests. That is why it is imperative that progressives and all those who care about preserving American democracy use this moment to set forth clear policies and a real agenda to clear the toxic undergrowth of paid private influence peddling that threatens to drag down representative government. We can, and must, drain the swamp to achieve the freedom of effective and honest self-government through fair representation. Liz Kennedy is the Director of Democracy and Government Reform at the Center for American Progress.